Arts & Culture | Unto The Breach: Can Shakespeare Help us Unravel the Palestinian-Israeli Conflict? Next week sees the UK premiere of Unto the Breach, an adaptation of Shakespeare's Henry V by Al Zayotuna, Europe's most renowned Palestinian theatre and dance company. Ahmed Masoud and Souraya Qabbani explore the parallels and paradoxes behind the production. It is hard to imagine how a 16th Century Elizabethan text written at the height of the European Renaissance might help us to understand what is going on in Palestine and why the conflict has lasted for so long. Yet this is exactly what our new adaptation of Shakespeare’s history play Henry V is attempting to do. This is not a Falstaffian trick, but an ambitious new production by the renowned Palestinian Dance Theatre company Al Zaytouna. Entitled Unto the Breach, the show involves a fusion of contemporary and Palestinian folk dance (‘dabke’), poetry, theatre and digital media, set to a soundtrack of traditional Palestinian music and original compositions by David Randall, composer and guitarist from Faithless and Slovo. The show is narrated by a Shakespearian Chorus – much as in the original play – but here she bids the audience to imagine “the vast olive groves of Palestine” and “the very gates of Jerusalem” rather than the 15th century battlefields of France. The ambitious adaptation was born out of a desire to find a new way to tell the Palestinian story, and to reach out to Western audiences who would not otherwise experience Palestinian culture or hear a Palestinian perspective on the Palestinian ‘problem’. Al Zaytouna wanted to find a vehicle that Western audiences could relate to and that would enable them to empathise with the Palestinian story. Shakespeare was a natural choice because of the universality of his themes, and the way he has been embraced by countries and cultures across the world. 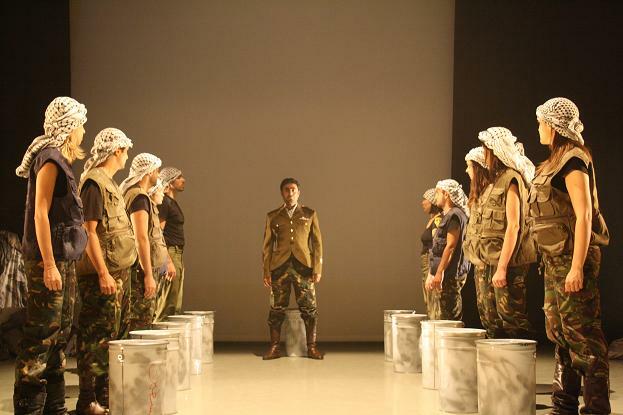 The choice of Henry V – one of Shakespeare’s most famous war plays – might at first seem odd for a troupe whose mission includes combating the stereotypical association that many people make between Palestine and conflict. But the premise of the play – that of a young leader compelled to lead his people to fight against a much stronger army – provided a strong parallel with the Palestinian story, and an opportunity to explore the motives behind conflict, as well as its purpose and limitations. Shakespeare’s play tells the story of the young English king Henry V, and the events surrounding his victory over the mighty French army at the battle of Agincourt in 1415. It has often been interpreted as a straightforwardly patriotic play that glorifies both the young leader and the exploits of war more generally. The play does, however, have a darker side to it. Several of the comic characters so common to Shakespeare’s plays are in fact quite cowardly, scheming and unsavoury, and join the campaign for war to line their own pockets through plunder, and even the eponymous hero makes some dubious decisions in his campaign for victory, such as executing defenceless French prisoners in the final battle. Unto the Breach takes the premise of the original play and transposes it to Palestine, telling the story of the Chairman, a young Palestinian leader who embarks on a revolution to free his people from oppression. 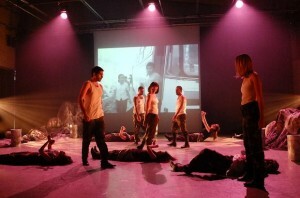 In doing so it captures something of the original play’s ambivalence towards war. On the one hand, it celebrates Palestinians’ efforts to change their circumstances and shape their future through revolution, but on the other it recognises that these efforts have not yet succeeded, and that Palestinians still live under occupation. It also highlights the internal power struggles that have marred such efforts, and depicts some of the darker outcomes of these struggles, such as in a scene where the Chairman executes two of his own people to quash a rebellion. In the original play, the Chorus repeatedly draws the audience’s attention to the inability of the theatre and actors to accurately convey all aspects of the historical tale of King Henry. Instead, the Chorus repeatedly appeals to the audience’s imagination, indicating how our understanding of past events is constructed – and embellished – by those who recount them. The show thus takes both a sympathetic and a critical look at the issue of political leadership and fighting for a cause, and avoids falling into the propagandist trap that Shakespeare’s original play has occasionally been accused of. 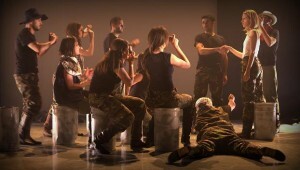 In examining some of the universal themes that flow from a closer reading of the play such as courage, determination, human fallibility, and resilience in the face of adversity, the troupe hope that Unto the Breach will resonate with audiences who are not familiar with the Palestinian struggle and enable them to understand it a little better. Unto the Breach will debut on Friday 9th and Saturday 10th November 2012 at the artsdepot in London. Tickets are available now from the artsdepot box office on 020 8368 5454 or from www.artsdepot.co.uk. To find out more about Al Zaytouna please visit www.alzaytouna.org. Souraya Qabbani is a freelance social policy consultant who specialises in local government work. She is also the managing director of Al Zaytouna Dance Theatre and a dancer with the company. « Previous: Event | Up the Anti: How can we reclaim the future? Can welfare for the rich unravel anything?